Best 4-star holiday home! Generous and modern! Property 3: Best 4-star holiday home! Generous and modern! Property 24: Treat yourself to your vacation where it is most beautiful in Bad Harzburg. "Hüttenflair" on the lake, with fireplace and wifi! Newly renovated ! Property 35: "Hüttenflair" on the lake, with fireplace and wifi! Newly renovated ! 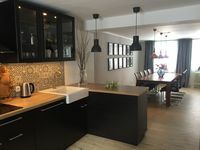 Holiday house in Goslar for up to 5 persons, children and dogs welcome, WLAN incl. Property 37: Holiday house in Goslar for up to 5 persons, children and dogs welcome, WLAN incl. Property 42: Detached holiday residence in the wonderfully beautiful Harz. 5 star log cabin with sauna + fireplace in the Alps - Chalet - Style, Wellness "Hut"
Property 47: 5 star log cabin with sauna + fireplace in the Alps - Chalet - Style, Wellness "Hut"
Holiday home Casa Cara located directly at the forest. Property 50: Holiday home Casa Cara located directly at the forest. Wonderful house in the middle of Altenau. Plenty of space for everyone. A very old house just next to the old church in Altenau, but everything brought up to date on the inside. Four nice bedrooms with pleasant beds, large living areas and also a small outdoor area from where you can watch and hear the bells from the cows in the center-of-town field while perhaps enjoing one of the beers from the local Altenauer brewery. We spend 6 days in the house, three generations, 8 people total. Absolutely no frictions :) The town is nice and local. There are shops in town, but like so many other small towns you will also find the high street rather deserted and closed down - probably due to Amazon and the likes. Still, meal options are plenty as long as you enjoy schnitzel, sp&auml;tzle, wurst and so on, which luckily we do - and it goes really good with a beer :) We found Tripadvisor to be quite accurate for tips on restaurants, but if we should name a couple of good places it would be Landhotel Alte Aue and also Zum L&ouml;wen. Be advised to reserve a table in advance, especially for larger groups. We were 8, and that seemed to be a bit too much for the kitchen capacity and we would be refused a number of times before finding a willing chef. The house and the town is an excellent place to be if you want to explore the Harz. There are just so many things to do and see. If you are into hiking we will recommend to join us all in the hunt for stamps (Harzer Wandernadel). Passes can be bought in the local tourist information that also carries maps. If in doubt: go to Altenau!